Hotel Relais il Cestello is an old structure, used in the past as a post office that functioned with horses and buggies. The Hotel looks on Piazza di Cestello and from the windows you can see the beautiful Cestello Church, the surrounding area of San Frediano, the Church of Ognissanti and the Arno River. San Frediano is a very characteristic old Florentine area where you may still find wood, leather, glass and jewelery shops. 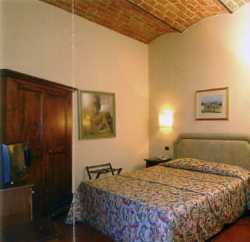 Close to the hotel are the Piazza del Carmine, Piazza Santo Spirito and the Pitti Palace. All rooms with bathroom/shower, Air Conditioning, phone, mini-bar, TV, hair-dryer. Internal structure adequate for disabled persons. The Florence Hotel Relais Il Cestello is conveniently situated in a tranquil yet central part of town on the south banks of the River Arno. The Hotel overlooks the charming Piazza di Cestello and is moments away from all the major sights of the Renaissance capital of the world. This stylish 3 star establishment with its spacious climate-controlled rooms is the perfect base whether travelling for business or pleasure. Within a short walk from this centrally located hotel you will find Piazza del Duomo - the heart and soul of Florence, the Uffizi Gallery, Michelangelo's David, Palazzo Vecchio and Ponte Vecchio. Discovering the magical delights of Florence from Hotel Relais Il Cestello Firenze is as easy as opening the front door of the hotel. In the winding street and cobbled lanes you will find a wealth of culture, history, arts and high fashion. Churches, Art Galleries, Restaurants and outdoor markets all add to this city's vibrant atmosphere. Our air-conditioned rooms are all stylishly decorated in Florentine style and come with all the modern comforts one could possibly require. 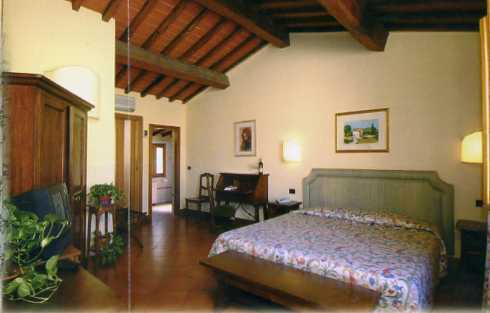 The Florence Hotel Relais Il Cestello boasts a fine selection of elegantly styled air-conditioned guestrooms to suit the requirements of any type of group, each designed with rich tapestries, hand crafted furniture and classic frescoes. Each elegant and spacious guestroom comes with a private en-suite, hairdryer and for that special added touch, a bathroom courtesy kit. After a long day of exploring the magnificent city of Florence sit back and enjoy our colour satellite TV service in a range of languages. Make use of the internet and direct dial telephone services to contact the office or loved ones. Room service is available as is a fully equipped mini-bar. A safe is also available in every room to store all your valuables and documents. There is no cancellation charge if you cancel at least 48 hours before 12.00 on the arrival day. For all cancellations received after such time a 01 night late cancellation charge will be debited to your credit card. 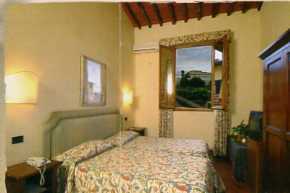 Hotel Florence Relais Il Cestello Florence is superbly located near the south bank of the River Arno of in the picturesque square of Piazza di Cestello. Our convenient location means that you are able to reach all of Florence’s most dazzling monuments in minutes, including the unmistakeable orange Duomo, the church of Cestello on the hotel’s doorstep, the Uffizi Gallery, the historical Ponte Vecchio and the innumerable shops, restaurants and amazing buildings that Renaissance Firenze is famous for. By taxi or by bus navetta until arriving at the train station Santa Maria Novella. Then continue on with bus D. 20 minuts by taxi from aeroport. Nearest airport: Amerigo Vespucci 5 Km.